The Universe Within features a dance of intriguing images photographed through microscopes in the biomedical research laboratories. The striking colours and mesmerising patterns bring to life the spectacular universe that lurks under the microscope and within our own bodies. Blood vessels spread through the retina like branches of a tree. The height of this tree is 2mm. In yellow Astrocytes are labeled. These fibrous cells surround the blood vessels (red) to control vasodilation and keep the vessel from leaking blood. In diabetes these functions are disturbed, which leads to blindness. My research looks at why this occurs. This image shows the complex blood vessel network in the trachea. Abnormal growth of new blood vessels is essential for tumour expansion. Understanding the genes that regulate the growth of new blood vessels result in novel approaches for the treatment and prevention of cancers. 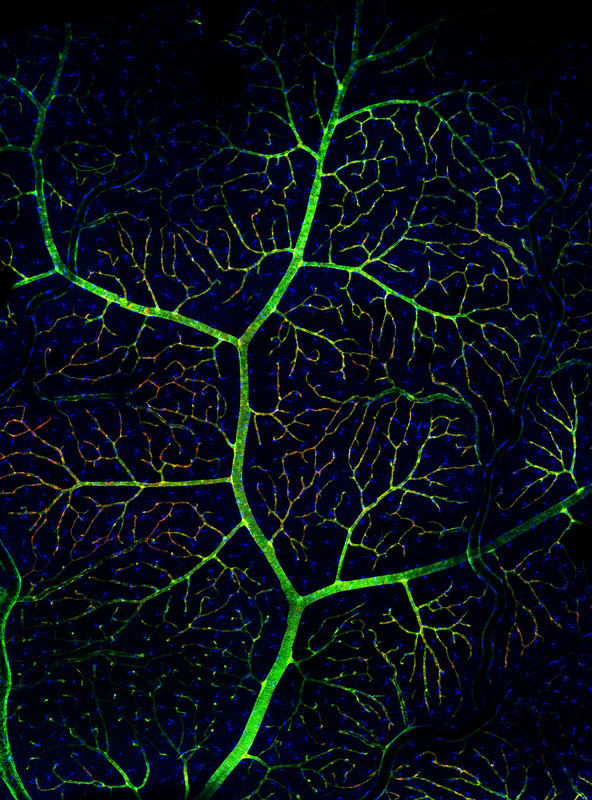 Confocal image of the vasculature of a diabetic rat retina. Understanding the changes to blood vessels and associated cells of the retina increases our chances of preventing diabetic retinopathy - a very common cause of blindness. The hippocampal dentate gyrus is one of two regions of the adult brain where new neurons are continually generated in a process called adult neurogenesis. 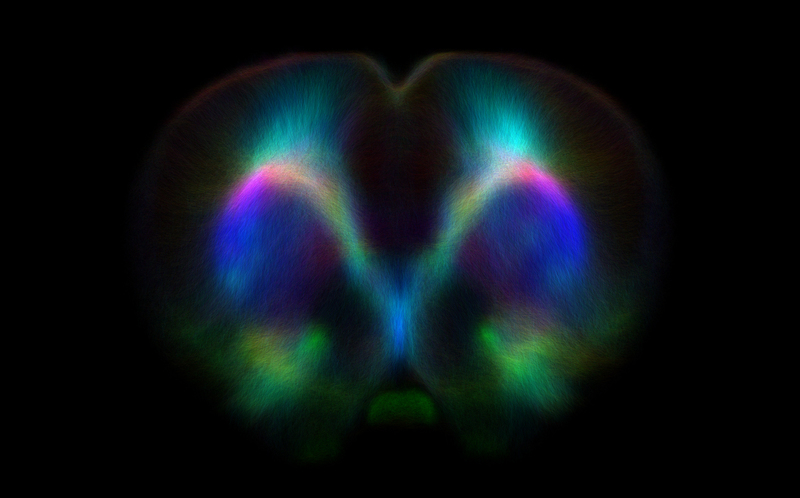 This image is of Green Fluorescent Protein (GFP) expressing newborn neurons (false coloured with respect to position in z-axis) in an adult mouse dentate gyrus. This particular mouse strain enables us to specifically label and analyse newborn adult hippocampal neuron morphology in different genetic contexts to better understand the regulatory mechanisms of adult hippocampal neurogenesis. The image is a 2x2 confocal z-stack tile at x40 magnification taken on LSM Zeiss 780. This immunofluorescent staining of the nucleus incertus in the brainstem of a rat shows the complex heterogeneity of its neurons. The nucleus incertus is emerging as a key area in an ascending arousal system involved in modulating behaviours such as stress response, wakefulness and motivation. 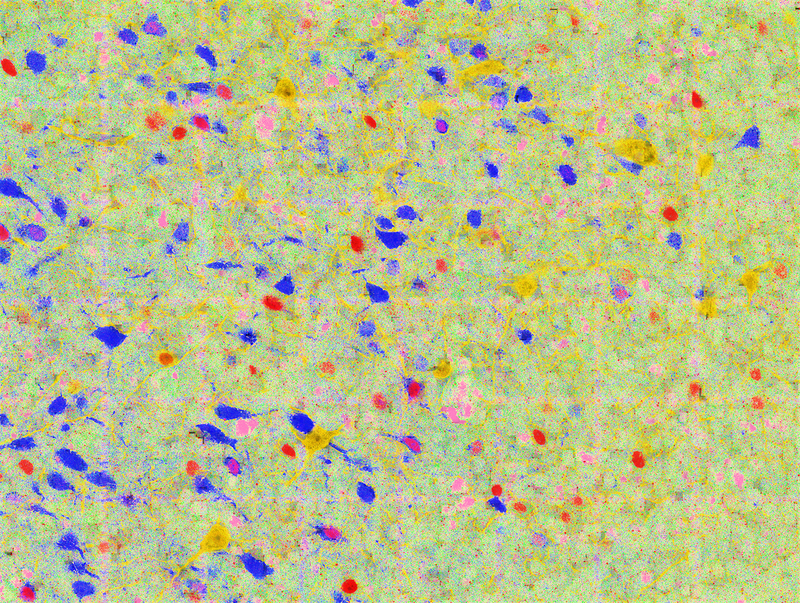 Research into this area has potential applications for the understanding and treatment of anxiety, depression and addiction.Fluorescent antibodies used to stain for the neuropeptide relaxin-3 and calcium-binding proteins calbindin and calretinin showed up in every possible combination in these neurons, giving rise to a spectacular array of colours reminiscent of the colourful flecks in an opal. 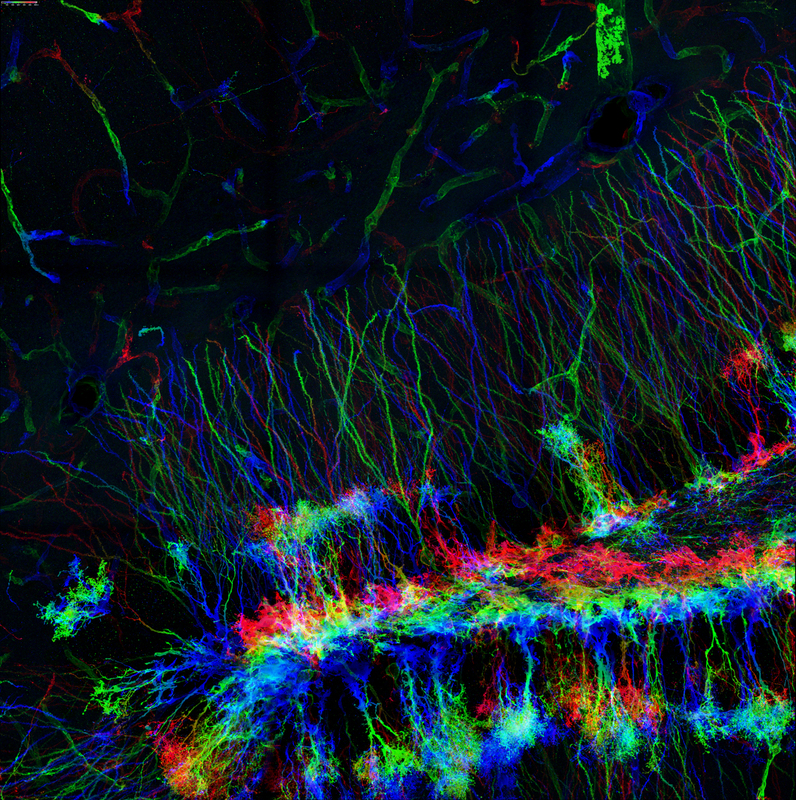 This image was taken with a Zeiss LSM 780 confocal microscope at the Florey Advanced Microscopy Facility in the Melbourne Brain Centre and edited with ZEN imaging software. Picture stains the neurosphre derived from human embryonic stem cell. Green represents the neuronal progenitor marker Nestin, and red represents the differentiated neuronal marker B-III tubulin, and all other types of brain cells can arise from this structure. 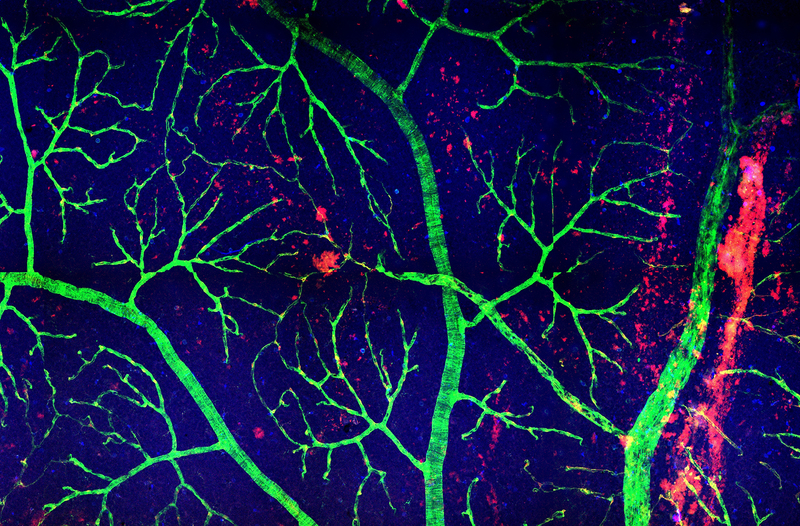 This image shows the growing blood vessel network in the retina of the eye. Abnormalities in blood vessels underlie eye diseases including macular degeneration and diabetic retinopathy. Understanding the genes that regulate vessel growth in the eye contribute to the development of novel treatments. 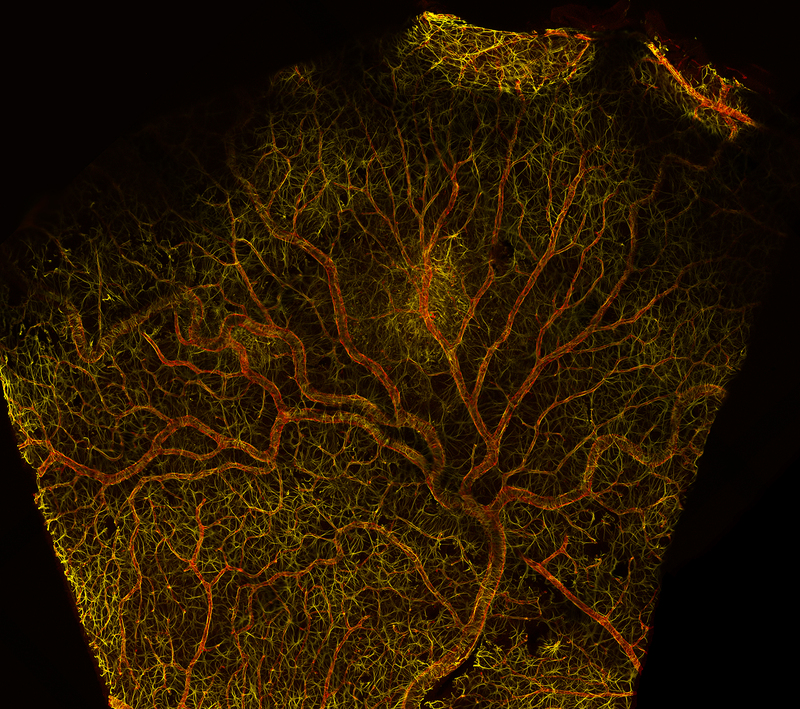 This is an artery 'tree' taken from the retina of a rat with diabetes. As well as the blood vessels in green, Pericytes are shown in red. 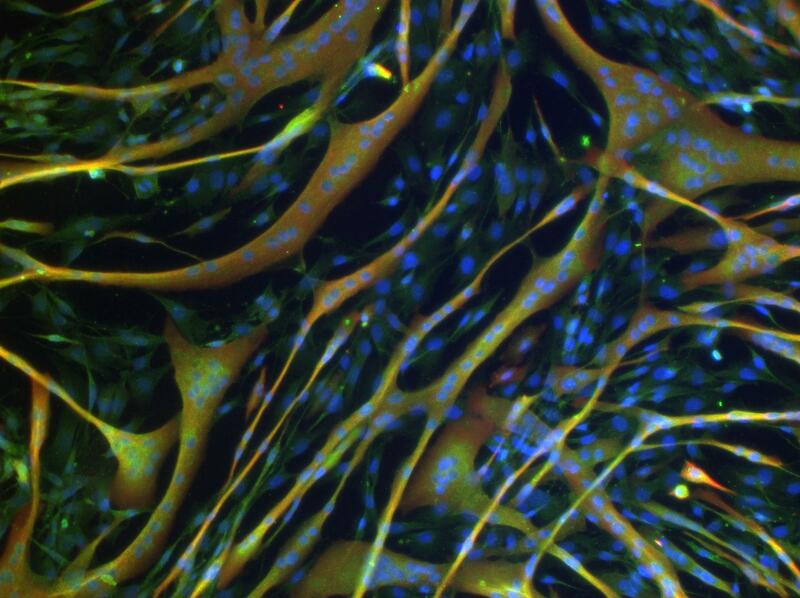 These are vascular controller cells that change the diameter of the blood vessels to increases or decreases blood supply to the retinal neurons. In early diabetes Pericyte cells begin to die out, so blood supply slows down and the retina begins to suffocate, initiating a process that ends with blindness. Labelled blue, Microglia are immune surveillance cells. 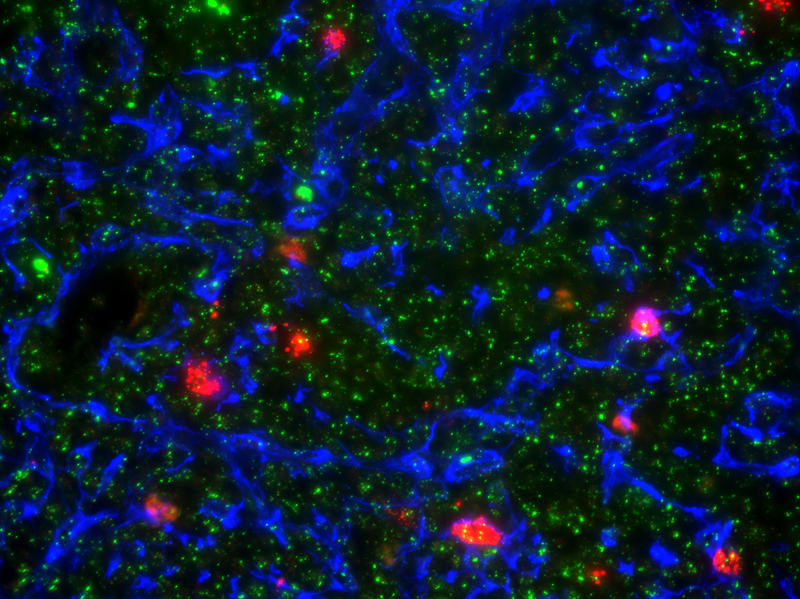 These Microglia are under investigation as suspects in the disappearance of the Pericytes. 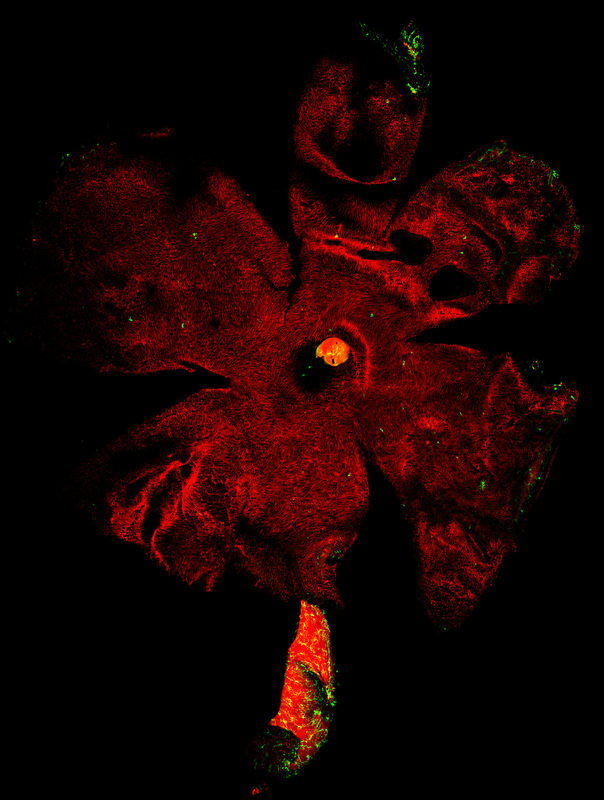 The tree is about 2mm tall, and is made of stitched together images taken with confocal microscopy. This image of neurons in the human brain cortex reveals part of the complex network of cells responsible for generating our thoughts and experiences. 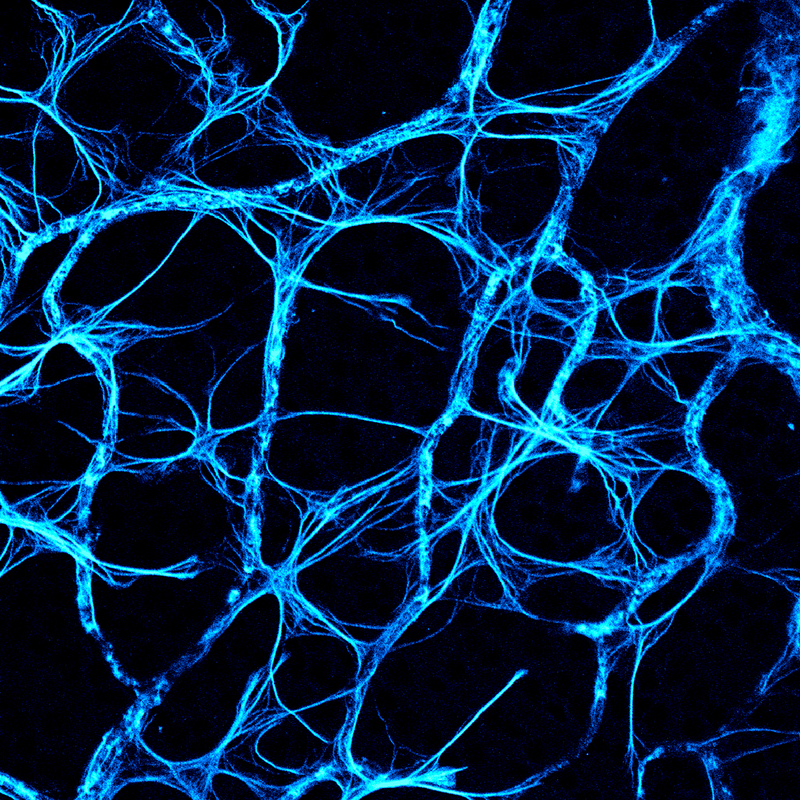 Dark blue structures are cell nuclei of neurons and glial cells (the most abundant cells in the brain). If you look closely, you can make out several large neurons - called "pyramidal neurons" because of their shape - from within the mesh of filaments. This particular brain belonged to a Huntington's disease patient. Studying neurons and their connections can help researchers understand the processes that go wrong in such disorders and ultimately develop effective treatments against them. 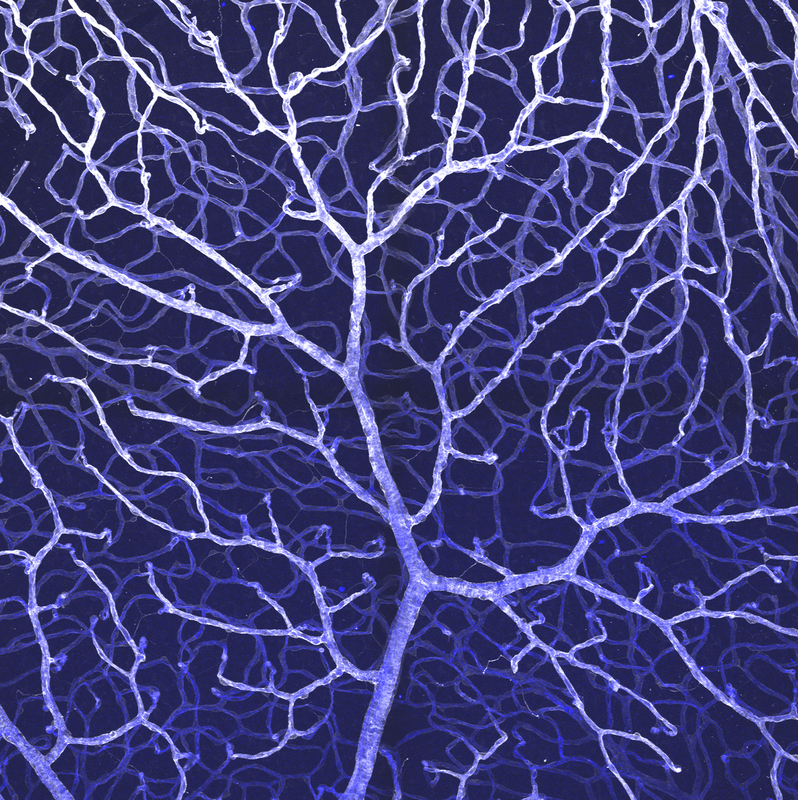 This image shows a growing blood vessel network in the skin. Abnormal growth of new blood vessels is essential for tumour expansion. Understanding the genes that regulate the growth of new blood vessels result in novel approaches for the treatment and prevention of cancers, as well as an array of eye diseases that involve abnormal blood vessel growth (eg: age-related macular degeneration, diabetic retinopathy and retinopathy-of-prematurity). 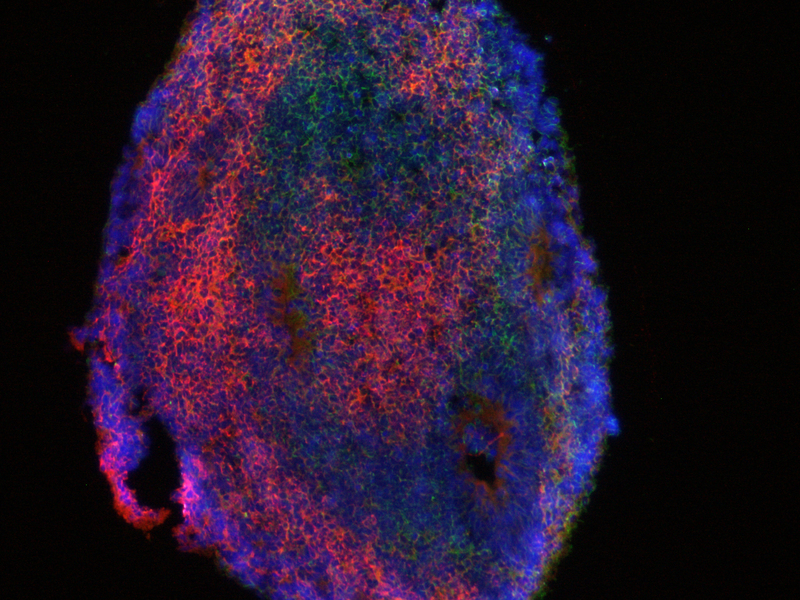 The blood vessels of the skin have been revealed using fluorescent probes that specifically label cells forming the inner lining of the blood vessel (magenta), a structural, support matrix that keeps the blood vessels intact (green) and cell nuclei (blue). 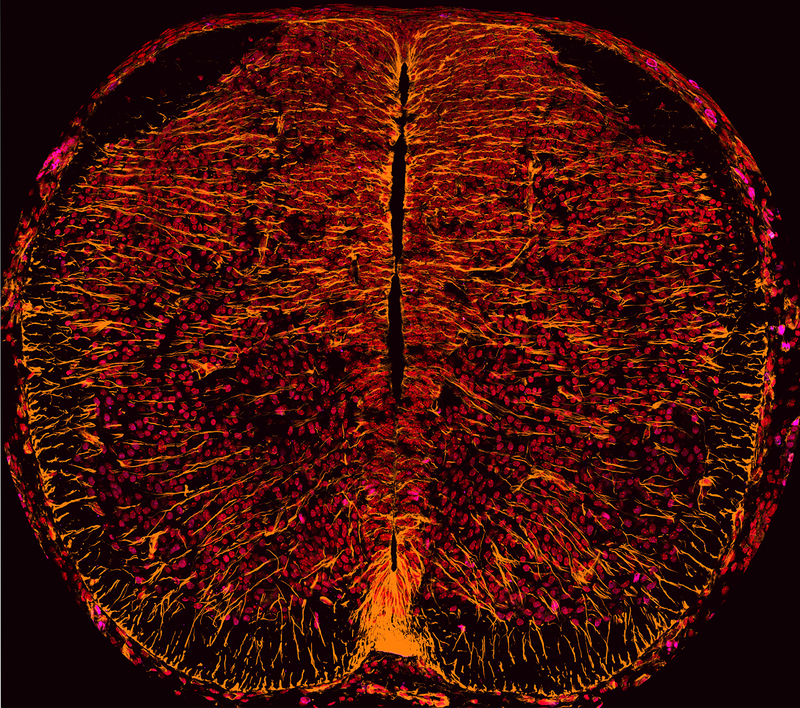 This is an image of a section of the lumbosacral spinal cord (adult rat). It depicts two columns containing neurons involved in regulating involuntary functioning of the pelvic organs, such as bladder and reproductive function. These neurons have been immunostained for choline acetyltransferase (green). 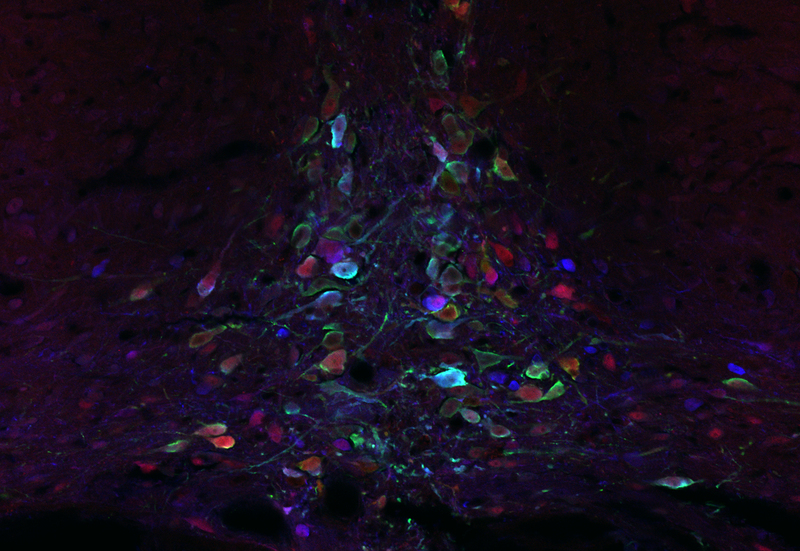 Some of these neurons also express the neurokinin-1 receptor (red). This receptor is the main target for substance P, which is released within the spinal cord by sensory neurons signalling pain. The expression of this receptor on these neurons suggests pain signalling may influence involuntary functions. 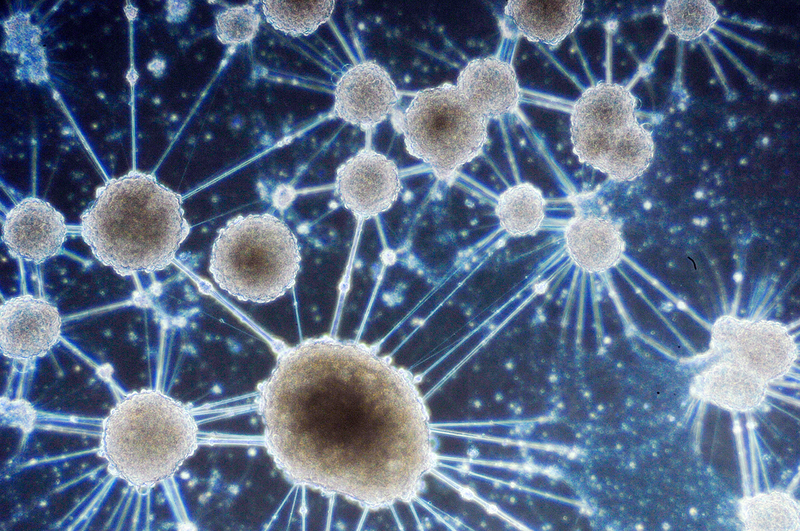 The image was taken under the Meta LSM510 confocal microscope, using a 20x objective lens. The image is a tile scan (two horizontal by one vertical). Six optical z-sections were acquired at a z-distance of 2.0 micrometers. Abnormal blood vessel growth is a key feature of many diseases including chronic inflammation and cancer. Therefore understanding blood vessel development can help to provide targets for therapies in these diseases. 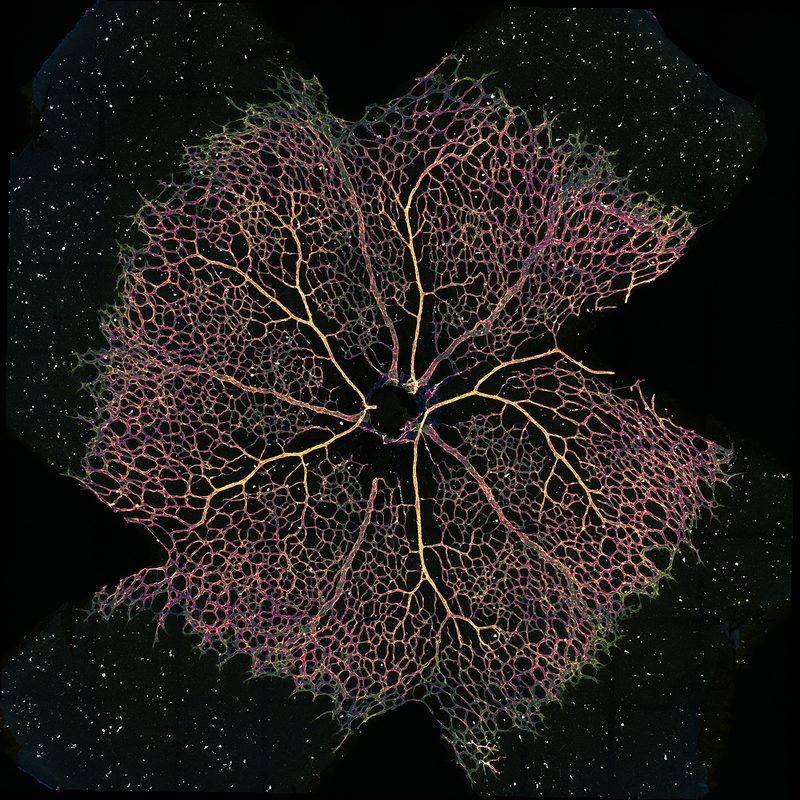 This image shows developing blood vessels in the retina of a mouse (yellow and purple) and dying cells (white dots). Cell death is a key process in development and in blood vessel formation. These images were generated using state-of-the-art diffusion-weighted imaging and tractography techniques in order to identify the rat corticospinal tracts (CSTs) which are invisible to conventional MRI or CT. This was done in order to assess the health of the CSTs after traumatic brain injury which has controversially been linked to the later onset of motor neurone disease (MND) like symptoms. This image shows the blood vessel network in the adult eye. Abnormalities in blood vessels underlie eye diseases including age-related macular degeneration, diabetic retinopathy and retinopathy-of-prematurity. Understanding the genes that regulate blood vessel development in the eye result in novel approaches for the treatment and prevention of these diseases, and others that involve abnormal blood vessel growth (eg: cancer). 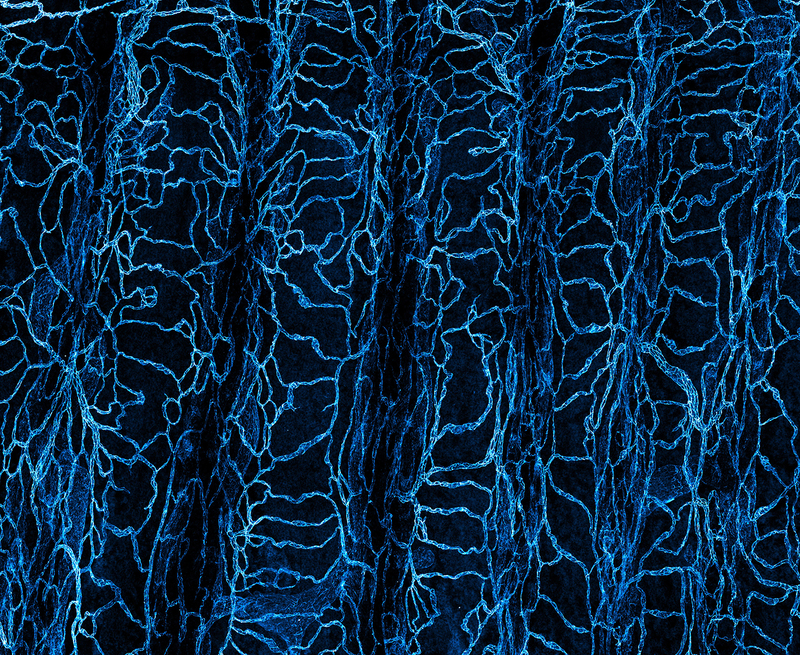 The blood vessels of the retina have been revealed using fluorescent probes that specifically label cells forming the inner lining of the blood vessel (blue) and a structural, support matrix that keeps the blood vessels intact (white). A bright field image of hippocampal neurons that had clumped together due to culture in serum-free conditions. The image was taken at 10x magnification. It is a section of a mouse thymus. An antibody, K5 (blue), is used to stain epithelial cells in medulla. Aire (red) expressed by few epithelial cells in medulla. H2AX (green) represents DNA damage in cells. Tile scan of the wholemounted retina, with the optic nerve attached. Microglia expressing GFP, and photoreceptors labelled with PNA. This image was captured when looking at the expression of TRPV4 in myotubes, produced from the C2C12 muscle cell line. The muscle cells were staining by Immunofluorescence to visualise the expression of actin (red), TRPV4 (green) and nuclei (DAPI- blue). 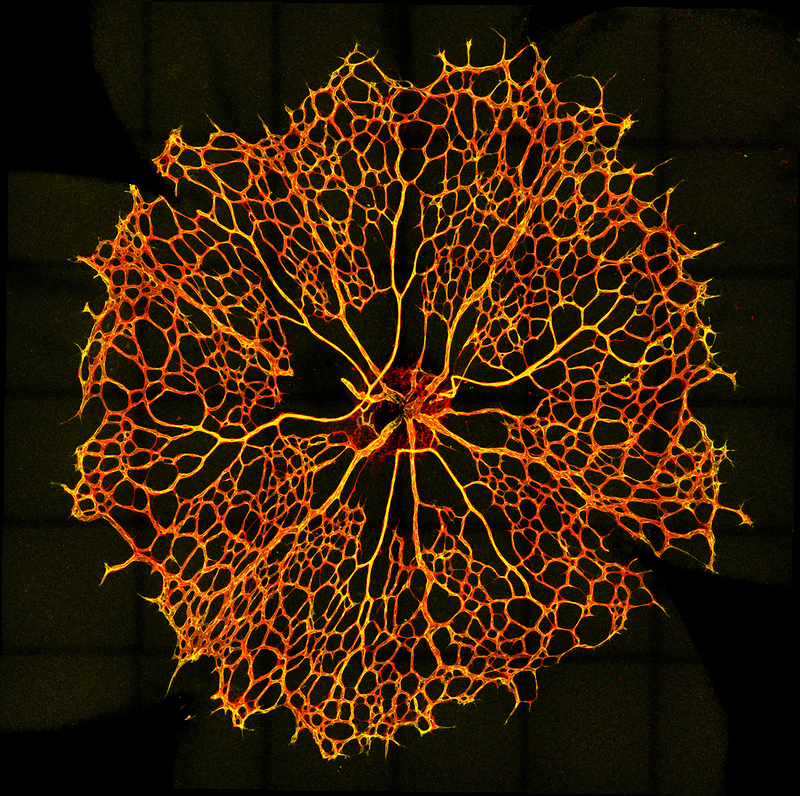 Astrocytes and blood vessels in the mouse retina labelled with GFAP. Confocal Microscopy, 63x. 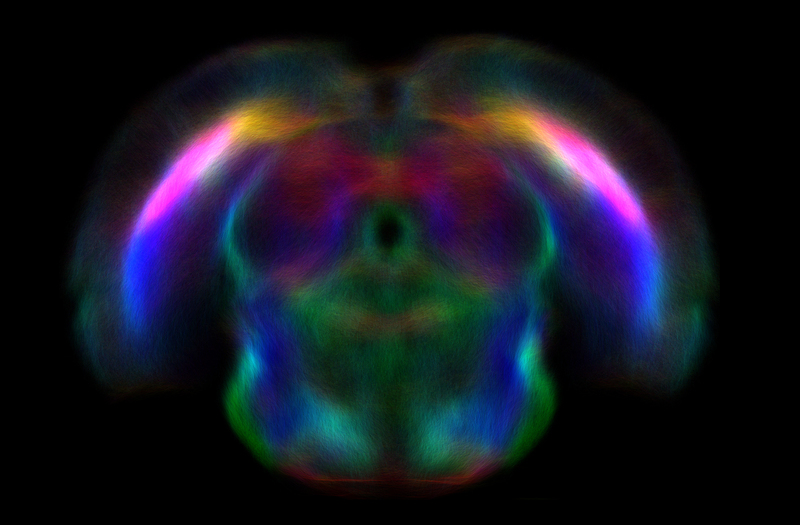 Single plane tile-scan of a transverse section through embryonic mouse spinal cord at E12.5. The image is represents quadruple labeling immunofluoroscence for Nestin (orange), Bisbenzamide (Red), Sox10 (purple) and Phox2b (light purple).